There are approximately 1.1-1.2 million motorcycles on the road in the UK. They account for around 1-2% of the traffic on the road, yet around 20% of them account for the deaths and serious injuries on the road. If you are a motorcyclist you are around 40 times more likely to be killed in an accident in comparison to a car driver. The injuries that you will sustain in a collision will also be more severe when riding on a bike than in a car or other “protected” vehicle. It is unfortunate to say that bikers bear the “brunt” of injuries when it comes to road traffic accidents in comparison with cars. To add insult to injury, bikers are more likely to be blamed for the accident, be it partly or fully. This makes for an even more immediate need to seek out a specialist motorbike accident solicitor in order to get not just the compensation that you need, but the help and support that you need during the case and any aftercare such as any physiotherapy needed to help you recover as fast as possible. How to Claim for Compensation? The first thing to do is to get in contact with a Bike Accident Solicitor who specialises in this area (You can use the contact form provided or call us on 0161 82 11 229). We have created a motorcycle accident claims procedure page so that you can be in the clear as to what happens during your claim for compensation. Below is a guide on the compensation claims process for if you have been injured in a motorcycle accident and you were not at fault (although unfortunately a lot of cases involving bikes are usually partial blame cases for both parties). 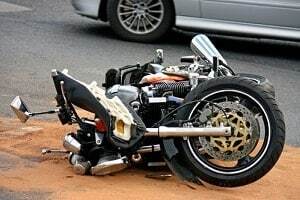 We are motorcycle injury lawyers and have experience in dealing with motorcycle accidents and have won numerous amounts of compensation for our clients even at partial blame. The first stage is to get in contact with us (061 82 11 229). This is so we can establish how you were injured and who was at fault. After this, we will send you a welcome/care pack and paperwork in the post. Once everything has been received, a meeting/further contact can be arranged in order to discuss the claim further covering issues like funding, difficulties being faced that need urgent attention and other such issues. After all this information has been gathered, we will begin the initial contact process of sending a letter out to the other party which will also mean that the police will start investigations needed and call upon witnesses for further information. During this time the other party’s insurer should send a corresponding letter within 21 days stating that they have received our letter and confirm that the accident circumstances and liability are being investigated. The liability letter of decision should be received within 3 months of the other party’s insurer receiving the acknowledgment letter. This letter will contain a decision from the other party as to whether they accept liability or not in regards to the motorcycle accident. When dealing with motorcycle accidents there are a higher number of cases where the other party will admit to fault however may also allege that you were partly to blame. This is also known as contributory negligence. Consideration and investigation will take place for this type of allegation. Usually with this type of allegation, liability decisions are often delayed until the required evidence is gathered. E.g. a police collision investigator’s report may be required so until it is ready, proceedings are “paused“. When liability has been admitted by the other party or if the case strongly favours you, medical records will need to be obtained from leading independent medical experts specialising in fields that are relevant to your injuries. Waiting time is often the case here due to the work load of these medical experts. To help with the process, we will often agree with the other party to use a case manager from a rehabilitation provider to oversee the co-ordination of rehabilitation. The other party will normally agree to this and to cover the costs of any such rehab as it speeds the process along of your recovery time which also means less costs incurred from the other party. If you have suffered a more serious injury, first medical reports will take longer to be obtained (usually not before 6 to 12 months after the bike accident). Due to the severity of a more serious injury, repeat reports and examinations will probably be required as the injuries will cover a vast area which the initial medical expert will not be an expert in all those fields so will be unable to provide a reliable prognosis as to your recovery. We will be able to place a value on your claim when we have all the final medical reports that are needed. With this information we will use the recent court awards as reference which will put us in a much better position to value your injuries accordingly. These award cases are used to form the basis of the Judicial Studies Board Guidelines for general damages awards. These are updated every couple of years and cover areas such as suffering, pain and loss of amenity. Throughout the case we will ask you to keep accounts of any relevant documents/information relating to a claim for financial losses. When we have obtained all the medical records and reports needed and are in a position to settle the claim, we will ask for these records in order to advise you on a suitable offer to be made to the other party. Sometimes offers are not accepted from the other party. They may come back with a counter offer, which we will advise you accordingly on how to proceed. Negotiation usually takes place from you and the other party and usually a settlement is reached. If an offer of settlement isn’t reached, then we may advise that court proceedings should commence. Due to the time it takes to calculate the value of the claim (can take a few years) we usually have a trial on liability. This is to establish whose fault the accident was. It can be a case of full blame or shared blame with a different degree of blame appointed between the parties. This is to obtain a quicker judgment and interim damages payment received (assuming the judgment goes in your favour). If after all the above a settlement has not been reached then a trial takes place within 5 – 9 months or so once the court proceedings have been served to the other party. Sometimes due to the severity of the injury for example a severe brain injury where the opposing party cannot provide their own instructions, a representative from the Court of Protection will be appointed on their behalf. This is to be treated as a guide of all the steps involved. There is a vast difference between the guide and what actually happens in practice as a lot of cases usually get resolved before any of the major steps like court and trial take place as both parties don’t want to drag things out too long. If you have any questions or concerns regarding any of the above or anything regarding a bike accident you may have had, you can contact us using the form provided or call us on 0161 82 11 229.